UMW Debate has raised $ 5,730 from 62 gifts! Support the UMW Debate Team on #MaryWashDay! 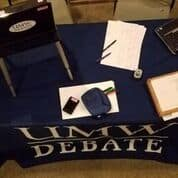 The UMW Debate Team competes at regional and national policy debate tournaments and provides public debate programming for the UMW community throughout the year on topics like gun control, national health insurance, and tuition. We offer opportunities to students of all levels of experience and varying academic interests to learn valuable research, media literacy, speaking, and advocacy skills. In any given year, our debaters prepare and deliver over 100 hours of speeches! The team travels to 12-16 competitions across the country throughout the year. Donor support helps offset rising travel costs. 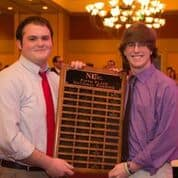 The Debate Team also hosts two intercollegiate competitions each year. Donor support helps us to keep event costs down, while providing exceptional tournament experiences for our guests. While we no longer haul tubs and paper files to tournaments, today’s Debate Team requires 21st century gear – laptops, wireless internet, laptop stands, video cameras, storage devices, and online storage and research subscriptions are essential to our team's success. Donor support helps us keep our technological edge. Economic realities have made students more likely to need to work during their time at college, which has sometimes affected their ability to fully participate/travel with the team. In order to help recruit and retain students, we are hoping to provide financial assistance to offset some of the burden on our students. Donor support could make the difference for one of those students.